This book is reviewed by James Tan. 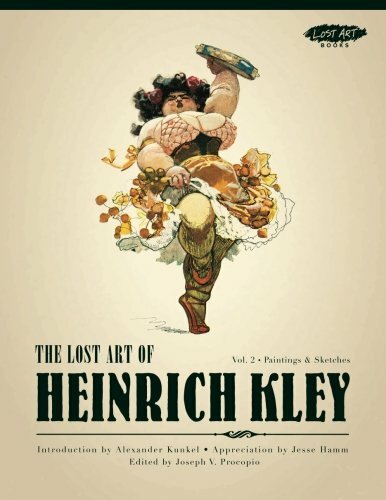 Heinrich Kley was a German artist in the great tradition of ink drawings and The Lost Art of Heinrich Kley, Volume 2: Paintings & Sketches contains enough artworks to please all his admirers - both new and old. If you do not know who he is, you are in for a treat. Heinrich Kley’s drawings are surreal and dark, and showcase his strange sense of humour. His rich imagination is evident in this book, especially his renderings of anthropomorphic creatures. His pen and ink drawings have long been a source of inspiration for generations of animators, illustrators and cartoonists; he is unmatched in his pen and ink drawings of bizarre satirical cartoons. Even Walt Disney was inspired by his works and Fantasia was one of the notable works that was strongly influenced by Heinrich Kley. There are two volumes in total: all the images are beautifully produced and come together with insightful essays by prominent artists who admired his works. The Lost Art of Heinrich Kley, Volume 1: Drawings showcases more of his drawings while Volume 2 presents his rarely seen paintings and preparatory sketches - which gives some insight to this influential artist. Both books are in paperback and published by Picture This Press. Another book on Henrich Kley worth checking out is the The Drawings of Heinrich Kley by Dover which contains numerous spot illustrations of his work and his imaginative universe where elephants ice skate and crocodiles do alpine climbing.